Puustellin Tuki ry is an independent third sector association whose purpose is to maintain and develop the potential and possibilities of people with partial work capacity. Puustellin Tuki ry upholds Puustellin Työkylä, which is located in Laukaa, Central Finland. Puustellin Tuki ry is a member of Central Finland Community Support Association, Federation of Finnish Enterprises, National Workshop Association (TPY), Finnish Federation for Social Affairs and Health (SOSTE) and Vates foundation. Our purpose is to support people with partial work capacity in maintaining and developing their professional skills, employment and ability to work. Each of our employees receive work and guidance fit for their individual needs. Working hours and weeks are designed in a way that supports employees’ other aspects of life. Our aim is to provide conditions that encourage towards improving one’s life quality and active life management. Our organization consists of handicraft workshop, wood workshop, kitchen, and property maintenance. We produce a large variety of quality handmade utensils, gift items and decorative items for retail and our own shop. We also do customized work. Located near Puustellin Työkylä, beside the lake Iso Kuhajärvi lies our cottage that is available for rent all year round. The cottage contains beds for 6 to 8 persons, a sauna, bathroom, fireplace, furnished terrace, BBQ equipment, and kitchen (with microwave and refrigerator). For an additional cost, you can enjoy the comfort of a traditional smoke sauna. Our Aito sauna can be booked for a maximum of 10 people. The facility also has a lounge with a fireplace, two dressing rooms, two shower rooms and a smaller sauna. Towels are included in the fee. 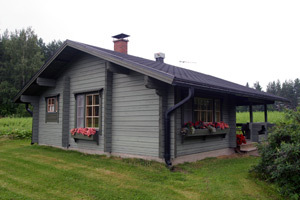 Our atmospheric smoke sauna is located by the lake Iso Kuhajärvi. The facility includes a toilet and rooms for dressing and showering. Towels are included in the fee. We produce a large variety of quality handmade utensils, gift items and decorative items from wood, metal and fabric. We also do customized work. See our website or facebook site for a closer look at some of our products. Welcome! Puustellin Tuki ry was founded in 1979 by social counselor Eila Ollikainen, associate professor Erkki Saari, artisan teacher Sirkka Rautala, and their associates. With help from Finland’s Slot Machine Association (RAY), Puustellin Työkylä was established in 1982. At first, Puustellin Työkylä’s functioning focused mainly on weaving but over time Puustelli has broadened it to various services. The wood workshop was established in 1990.